LAST WEEK: The Browns are already better off than they were when they went 0-16 last season, but Cleveland doesn't quite have a win. 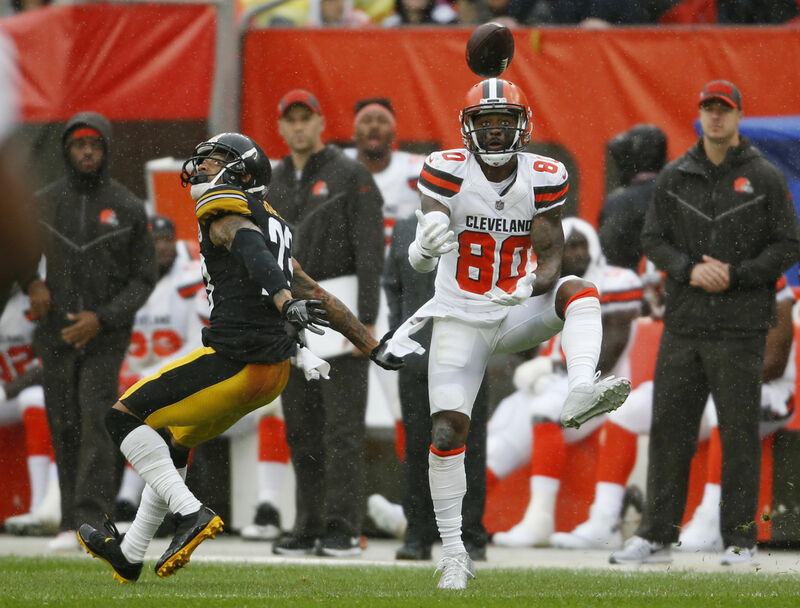 Playing in a rain-soaked atmosphere, the Browns erased a 21-7 deficit to force overtime against the Steelers, then tied 21-21 when a last-second field-goal attempt was blocked. OFFENSE: New Orleans struggled to contain Ryan Fitzpatrick against Tampa Bay last week, and now the Saints face off against Tyrod Taylor, who rushed for 77 yards and a touchdown on eight carries against the Steelers. Taylor, who was in Buffalo last season, finished 15-of-40 last week and struggled, but his profile as a starter is set. Taylor rarely tosses interceptions, but he will take sacks; Pittsburgh sacked him seven times in the season opener. Taylor does have plenty of weapons, though. Former LSU star Jarvis Landry caught seven passes for 106 yards against the Steelers, and although Josh Gordon had just one catch, it illustrated why he's so dangerous, a leaping, contested catch on the sideline for the touchdown that forced overtime. At running back, former 49er Carlos Hyde appears to be the bell cow for now after picking up 62 yards on 22 carries, with rookie Nick Chubb as a backup and Duke Johnson playing a third-down, pass-catching role. Up front, Cleveland has talented at guard in Joel Bitonio and Kevin Zeitler, and right tackle Chris Hubbard is an experienced veteran, but left tackle Desmond Harrison is an undrafted rookie. DEFENSE: A young Cleveland defense tortured Pittsburgh's offense last week, led by Myles Garrett, the No. 1 pick in 2017 who looks like he might be worth every bit of that pick. Garrett, who will primarily match up against Terron Armstead, had six tackles, two sacks, two more quarterback hits, two forced fumbles and a batted pass, but Garrett is far from the only gifted player on the Browns' defense. Emmanuel Ogbah had only one tackle against the Steelers, but he's a promising young pass rusher, and defensive tackle Larry Ogunjobi had seven tackles and a sack against the Steelers. Former Patriots star Jamie Collins and up-and-coming middle linebacker Joe Schobert (two fumble recoveries) give Cleveland a pair of talented linebackers. In the secondary, rookie cornerback Denzel Ward — the latest in the long line of Ohio State products — picked off Ben Roethlisberger twice last Sunday, and the safeties, Jabrill Peppers and Damarious Randall, are both capable of creating turnovers. For all the good against the Steelers, though, Cleveland did give up a lot of yards; the Browns allowed 4.5 yards per rush and 6.96 yards per pass attempt, meaning the Cleveland defense at this point might be dependent on big plays. SPECIAL TEAMS: Kicker Zane Gonzalez, a rookie last season, hasn't established himself as a weapon yet; he's 15 of 21 over two years. Punter Britton Colquitt is a talented, steady veteran, and the return man is Jabrill Peppers. Interior O-Line- Bitonio, Tretter and Zeitler are going to absolutely maul our DT’s. Don’t expect much interior push this week either. OT- Going against rookie UDFA LT Desmond Harrison will be the perfect opportunity to get Marcus Davenport going. RT Chris Hubbard will likely get plenty of help from TE David Njoku in trying to slow down Cameron Jordan, and that’s a good thing because they gave up four sacks to TJ Watt in week one. SLB 55 Genard Avery- Rookie fifth round pick out of Memphis will be used situationally as a pass rusher in a 4-3 Under Front. Tremendous power and burst. Had one sack and one FF in week one against the Steelers. We are going 0-2 mark it. We just aren’t good. That defense isn’t going to improve enough for us to compete this year. Armstead vs Mr. Arlington Martin High aka Myles G. Good matchup. I just hope the defense can muster up some sort of a pass rush. Here’s my concern: In week one Myles Garrett wasn’t having a ton of success against Steelers LT Alejandro Villanueva so they started moving him in to more of a 5-technique and he had more success against LG Ramon Foster. If we’re going out there with Josh LeRibeus again at LG we’ll likely see more of the same and it won’t go well. Good point however I think we are sound up front even if LeRibeus has to "fill in"@ week #2. The Bucs have a top 5-10 D line & for the most part, we dominated them up front. This is probably the one area (Saints O line) where I feel really confident. Well, I guess there's no need for you to even watch the game then, is there. My God, you post so much just like a loser. I knew the bullcrap that you posted a couple of months back about being positive this season was totally beyond your capabilities. I seriously think that nothing could make you happier than to have the Saints lose next week just so you could come back in here and spout more of your crap. I'm beginning to feel that old Will(Insert Team Name Here)81 is far more worthy of being called a Saints fan than you. Why do you even waste your time, and ours, pretending you're are a fan? Saints will throttle the Browns on Sunday.